Dr. Mohsin Ali Raza has more than 15 years of experience of working in the field of polymer composites and nanomaterials. He achieved his B.Sc. (Engg.) degree in the field of Metallurgy and Materials Science from University of the Punjab, Lahore in 2000. In 2001, he joined department of Metallurgy and Materials Engineering of University of the Punjab as a lecturer. He is currently working as Assistant Professor at the same department. He received his PhD degree in the field of Materials Engineering from University of Leeds, UK, in 2012 and his MSc (Engg) degree from Royal Institute of Technology, KTH, Stockholm, Sweden, in 2007. After completion of his PhD, he established his own research group at department of Metallurgy and Materials Engineering, University of the Punjab, which is actively researching on carbon nanomaterials, graphene, polymer composites and ceramics materials. 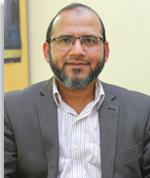 Dr. Raza has worked on several industrial research projects at University of Punjab and also supervised many MPhil, MSc and B.Sc (Engg) research thesis. In 2014, he won a grant of 17 million from HEC, Pakistan, to carry out research on a project “Synthesis of graphene nanoplatelets and development of graphene-nanoplatelets-based composites for electronic packaging and functional applications”. Dr. Raza authored more than 20 research articles, which were published in peer-reviewed impact factor journals, and presented papers in more than 10 international conferences. He is actively involved in teaching B.Sc. (Engg), MSc (Engg.) and PhD courses at Department of Metallurgy and Materials Engineering, University of the Punjab, Lahore. M.Sc. (Engg.) Materials Science with Specialization in Nanomaterials and Nanotechnology, (KTH, Sweden), P.E.